KAMPALA– Chief Justice Bart Katureebe dismissed reports that the Judiciary and the Land Probe Commission are clashing in the execution of their duties, but he said the latter needs to straighten up a few things in its operations. Katurebe said as a student of land law; he appreciates the commission’s role but advised that in some areas it has a lot to work upon in its operations. The Chief Justice clarifies that the Land Probe Commission wrote to them, complaining about the conduct of some judicial officers, to which he has reacted by forwarding the complaint to the Committee of the Inspector of Courts to investigate the said officers and make a report. “The statement from the land commission was read to the president in presence of Deputy Chief justice, Principal Judge that the chief justice was obstructing the work of the commission,” he said. Chief Justice, however, says there are needs for collective responsibility in the fight against corruption in the Judiciary, rather than pointing fingers and lamenting. He advised Judicial Officers to always use the available resources and aim at building a brick on the kind of Judiciary they want to work for. 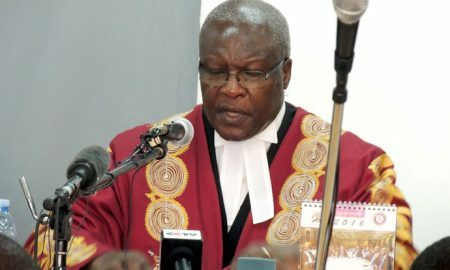 Katureebe also revealed that some judges like Justice Atwooki Rugadya have started running away from land-related cases, alleging that their names are being tainted to have been bribed.